The Magic Didn't End At Midnight! 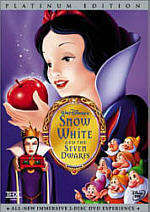 For more than 50 years after they produced their first feature-length animated film - 1937’s Snow White and the Seven Dwarfs - Disney didn’t create a single sequel to any of those efforts. Even though many of these movies were enormous hits, each new offering took on a different tale previously unexplored. Yeah, one could claim that 1945’s The Three Caballeros in a way acted as a sequel to 1943’s Saludos Amigos, but that’s not really true. They share some characters but neither offers a real plot; they’re mainly conglomerations of related shorts. That started to change in 1990 with the release of The Rescuers Down Under. Some will argue it wasn’t a real sequel either, as it didn’t really continue a story; it presented some of the same characters but didn’t move along a progressing storyline. However one wants to view the semantics of the case, the fact remains that Down Under broke an apparent taboo at the studio. After that, they slowly became more and more enamored of sequels to their big-screen hits. As of early 2002, only two other than Down Under debuted in movie theaters: the recent Return to Neverland and 1999’s Toy Story 2. Otherwise, all of them went the “direct-to-video” (DTV) route. That started with 1994’s The Return of Jafar, a continuation of 1992’s smash Aladdin. Actually, Jafar came as an extension of a then-current Aladdin TV program. Apparently it did pretty well, and a third flick - entitled Aladdin and the King of Thieves - resulted in 1996. Buoyed by the positive financial returns, Disney gradually got more and more into DTV sequels to big-screen animated offerings. 1997 saw the release of Beauty and the Beast: The Enchanted Christmas, a tale that actually takes place during the story told in the 1991 hit. 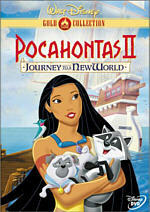 1998 brought us two DTV sequels: Pocahontas II: Journey to a New World - a spin-off from the 1995 flick - as well as The Lion King II: Simba’s Pride, the extension of the 1994 picture that remains the highest-grossing animated movie of all-time. You may notice a pattern in these releases. All of them came from recent films, and that pattern continued through the next couple of years. 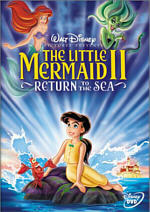 In addition to Toy Story 2 - which originally was planned as a DTV offering - the studio knocked out The Little Mermaid II: Return to the Sea, an extension of the 1989 smash. In addition, although the films extended via sequels were big hits and generally well regarded, they lacked the long-time “classic” status enjoyed by movies from Disney’s past. New material based on recent flicks didn’t seem like a stretch, but if the studio went farther back into their vault for inspiration, the situation likely would become stickier. Older fans might not be wild to see their childhood favorites revived for new editions. But that’s the studio did. This started with 2001’s Lady and the Tramp II: Scamp’s Adventure - a sequel to the 1955 treasure - Disney have started to raid the archives. In addition to Return to Neverland - intended as a DTV project but ultimately released theatrically - Disney apparently have DTV sequels to 1967’s The Jungle Book and 1961’s 101 Dalmatians, and 1941’s Dumbo in the works. They’re also making new tales based on recent flicks like The Hunchback of Notre Dame and Tarzan. Personally, I’m still not totally sure how I feel about these extended explorations. On one hand, I’ve always liked the idea of sequels that tell us what happened to characters later. Many flicks show participants involved in major life-altering events, and I think it could be fascinating to see how they deal with those after the fact. It may sound stupid, but I’d love to know what happened to the survivors of something like ID4; I mean, after you go through all that drama, how do you cope with it? But on the other, I can agree with those who see the sequels as cheapening the originals. Rarely will that be more true than with the latest Disney DTV sequel, Cinderella II: Dreams Come True. An extension of the 1950 classic - one of the studio’s most revered gems - we find out just what happened to Cindy after Prince Charming took her away to live happily ever after. If you’re expecting some dirt - like Cindy (here voiced by Jennifer Hale) gets slapped around by her hubby (Christopher Daniel Barnes) - then you’ll clearly be disappointed. Actually, if you’re expecting a single coherent narrative, you’ll also be disappointed. Instead, Dreams consists of three shorter vignettes, all linked together by one general device. Cindy’s stepsister Anastasia (Tress MacNeille) meets and falls for the town’s baker (Paulsen). However, her mother - aka Cindy’s wicked stepmother (Susanne Blakeslee) - thinks the breadboy is beneath her station, so she forbids the relationship. Eventually Anastasia - with a little prompting from Cinderella - follows her heart and hooks up with Mr. Yeastie. Notice a theme in these three tales? Dreams is all about being true to yourself and doing what you think is best. Actually, aren’t the vast majority of Disney plots along the same lines? Nothing here seems new, but since very few Disney flicks offer fresh, lively stories, I can’t really criticize Dreams for following the same trend. However, I can knock it for being a cheap, uninspired piece of work. Regurgitated plots are fine as long as the film does something with them, but Dreams is just a piece of product. There’s absolutely nothing memorable. The voice acting seems serviceable at best, and the animation looked atrocious. The artwork itself replicated the original film reasonably well, but Walt would spin in his grave if he saw the stiff movement on display here. Much of Dreams barely rises above Saturday morning TV caliber work; it’s an awkward piece of work. I also didn’t care for the film’s nods to current attitudes. I think a Cinderella sequel could have remained true to the original’s tone without seeming square or outdated, but the filmmakers instead decided to make things appear more modern. Admittedly, they didn’t go nuts in this regard, but the moments I saw were disconcerting. From Gus’ finger down the throat gesture to express disgust to the annoying pop update of “Bibbidi-Bobbidi-Boo”, the acknowledgements of the 21st century did little more than remind me how weak this film was. I’ve felt unimpressed with most of the Disney direct-to-video sequels, but Cinderella II: Dreams Come True represents the nadir of the form to date. The movie totally fails to recapture the charm of the original and it seems almost absurdly bland and generic. Stack onto that some of the crummiest animation ever to emerge from Disney and you have a nightmare come true. One casting oddity: Barnes played Prince Eric in The Little Mermaid. However, he was the only unexplained absent actor during Return to the Sea. I understood why Jason Marin didn’t do Flounder in both flicks; it’s a role for a kid, and he clearly would have been too old to do it after 12 years. If Barnes simply balked at all things Disney, I’d comprehend his absence from Sea, but since he turns up here, it seems very confusing. 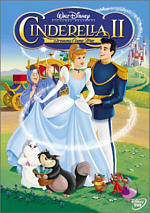 Cinderella II: Dreams Come True appears in an aspect ratio of approximately 1.66:1 on this single-sided, double-layered DVD; the image has been enhanced for 16X9 televisions. While not one of Disney’s best efforts, overall I thought Dreams presented a pretty solid picture. Sharpness offered the only modest concern. For the most part, the film remained nicely crisp and distinct. However, some wider shots often looked somewhat vague and tentative. They never seemed truly soft, but the definition appeared somewhat hesitant. Still, as a whole the program seemed clear and accurate. I detected no concerns related to jagged edges or moiré effects, and edge enhancement appeared absent. In addition, the production displayed no source flaws of any sort. Colors looked consistently terrific. The film showed a wide variety of lovely and accurate pastel hues that always seemed warm and vibrant. They never betrayed any bleeding, noise or other flaws, as they appeared clear and distinct. Black levels also came across as deep and rich, while shadow detail was clean and appropriately opaque. Really, only the vague softness caused any concerns here, as most of Cinderella II presented a very positive image. As with many recent Disney releases, Cinderella II provided both Dolby Digital 5.1 and DTS 5.1 soundtracks. While I appreciate the choice, I must admit this seemed like overkill for such a modest project. Dreams showed virtually no differences between the two mixes; I thought the Dolby and DTS versions sounded identical. The soundfield was pretty strongly anchored toward the forward spectrum, and even within that domain, I didn’t detect a great deal of activity. Music displayed fairly solid stereo separation, but effects stayed somewhat limited. General ambience appeared from the sides, and some modest panning popped up on a few occasions, but the track usually betrayed little more than vague atmospherics. The surrounds offered similar sound, though they provided a little additional activity during a few scenes; for example, fireworks cropped up decently from the rears. Still, this was a pretty lackluster soundfield. Audio quality seemed to be good for the most part. As a whole, speech was fairly warm and natural, and I discerned no concerns related to edginess or intelligibility. Effects were clear and accurate, and they occasionally showed decent dynamics; at times low-end response sounded pretty solid, such as when Pom Pom’s feet boomed on the floor. Music seemed clean and bright, but it often lacked much bass. I thought the pop songs sounded somewhat anemic, and the score also suffered from a lack of depth. Some bass appeared, but the response seemed weaker than I’d expect from a new film. Overall, the track remained acceptable at all times, but it didn’t add much to the movie. Cinderella II: Dreams Come True packs a few very modest extras. Most interesting is Musical Magic, a five-minute and 53-second featurette about the movie’s score and tunes. We hear from composer Mike Tavera and pop singer Brooke Allison. Tavera provides a basic and kid-friendly discussion of movie scoring; it’s nothing illuminating for more experienced movie fans, but it should educate the target audience nicely. Allison’s bits are just fluff. We hear more from the singer in the music video for “Put It Together”. We don’t actually see her, however, as the three-minute and 50-second clip includes nothing more than snippets from Dreams. Lame pop song, boring video - skip it. Two Disney staples appear next. We get a Cinderella Storybook entitled “A Little Misunderstanding”. This piece focuses on Jaq the mouse and offers the usual option to read the story yourself or have the narrator tell it to you. Cinderella’s Enchanted Castle includes three very simple mini-games that might offer a few minutes of fun for the little ones. They did nothing for me, but I’m glad Disney at least skipped the annoying random guessing games that marred other DVDs. When you start the DVD, you’ll find ads for some other Disney flicks. There’s a promo for the hotly anticipated DVD video release of Beauty and the Beast. The trailer highlights the inclusion of “Human Again”, the song added for the IMAX theatrical release of Beauty. In addition, the DVD opens with promos for The Hunchback of Notre Dame II, The Many Adventures of Winnie the Pooh, and Disney DVD as a whole. These clips also can be found in the Sneak Peeks area alongside additional ads for Tarzan and Jane, 101 Dalmatians II: Patch’s London Adventure, Schoolhouse Rock, American Legends, Monsters Inc. and “100 Years of Magic”, an ad for Walt’s 100th birthday celebration at Disney World. Lastly, Dreams tosses in a few DVD-ROM pieces. Most significant is a “preview” version of the Cinderella’s Dollhouse CD-ROM. Basically this lets participants - presumably young girls - decorate various sections of Cinderella’s world. I don’t plan to uninstall Civ III to play Dollhouse instead, but since I doubt 34-year-old heterosexual males fit the target demographic, I won’t judge it too harshly. Actually, “Dollhouse” is really the only DVD-ROM extra. That area offers direct links to the DVD Storybook and the “Enchanted Castle” game, but we find nothing else other than a weblink to Disney’s website. Oddly, when I clicked on it, I went to a page devoted to Max Keeble’s Big Move, and it’s an outdated one at that; it acts as though the October 2001 release hasn’t hit screens yet! Wish that I could return to a happier time before I saw Cinderella II: Dreams Come True. While not an aggressively bad film, it seems excessively bland and lifeless, and it totally lacks the spark and life found in the original movie. Its 73 minutes plod by, as it never remotely threatens to entertain or delight. The DVD offers very good picture with decent sound and a weak roster of extras. I suppose some little kids who never saw the original might enjoy Dreams Come True, but anyone with fond memories of Cinderella should stay far from this poor piece of work.